Hello all. We are at the half mark to the Dragon Master Foundation drawing for my dragon. Thank you so much to everyone who has entered! 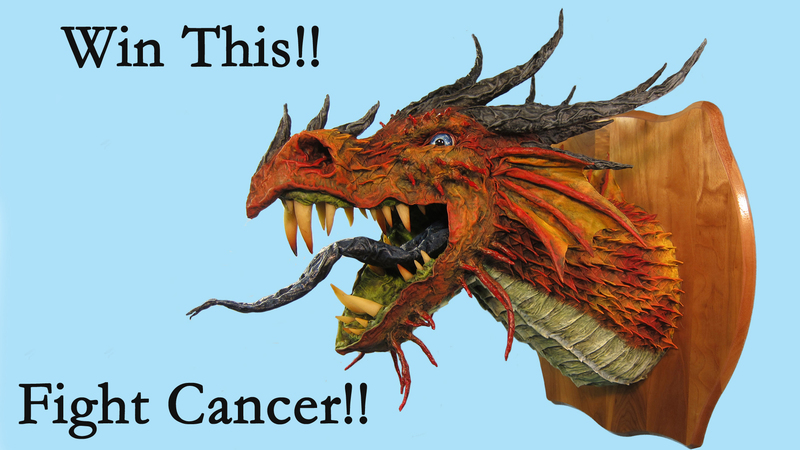 To show my appreciation, and to show my dedication to this cause, I’ve decided to double your chances of winning a dragon! I’m throwing my “Great Paper Mache Dragon Trophy” into the drawing. Yes, the same one whose video went viral in December. He is going to a home of a person who cares about kids with brain cancer. I’ve reintroduced the video with a new plea. You can watch it if you want (click on the photo below). More importantly, if you haven’t entered the drawing, please do. You can enter here, http://tinyurl.com/winadragon. The first name drawn will have the choice of either of the two dragons. The second name drawn will win the other dragon. The drawings will take place on June 15. Please share. And thank you again for all of your support! Click this to watch video. Thank you! And I must also once again apologize to my friends outside the US who can’t participate in the contest. The foundation would love your support, but contest regulations and shipping costs just won’t allow it. Sorry. This entry was posted in Paper Mache Dragon for the Dragon Master Foundation. Bookmark the permalink. 7 Responses to A chance at TWO paper mache dragons! What a wonderful thing to do. You have a beautiful heart! So do you Willow. Thank you! I think it’s great that you are donating your work for such a good cause. Just wanted to let you know that the URL to donate seems to be broken. yikes! thanks for letting me know! Just to let you know David that I fixed that link. As often happens the period of the sentence got stuck with the link. Thank you again for the alert. hi dan, even though we cannot participate from europe, i would like to support your cause in some way. so, i just have nominated you for the liebster award, in hope it sends a little more traffic to your wonderfully creative site. Thank you very much Doris! You are very kind indeed!